If you haven't already noticed, the latest trend in fashion is ombre dyeing! The slight color shift from light to dark is capturing the eye of fashionistas and home décor enthusiasts alike. We decided to take a step into this trend by dyeing a few pairs of simple white kicks. We love how bright and fun they turned out! Wash tennis shoes with laundry soap, either in the washing machine or by hand. Leave damp. Mix dyes with water according to package instructions. Pour into plastic containers and stir. 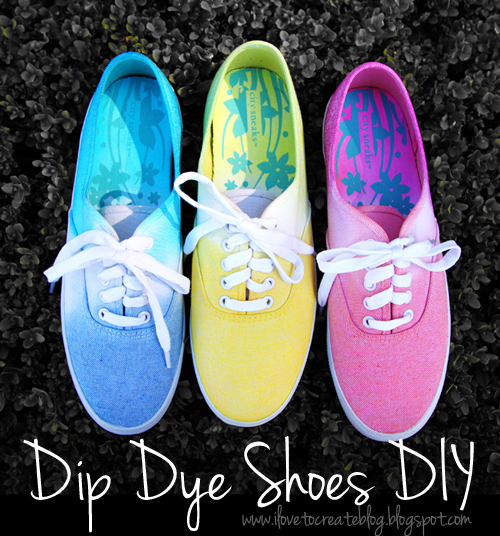 While shoes are still damp, dip shoes in dye as desired. 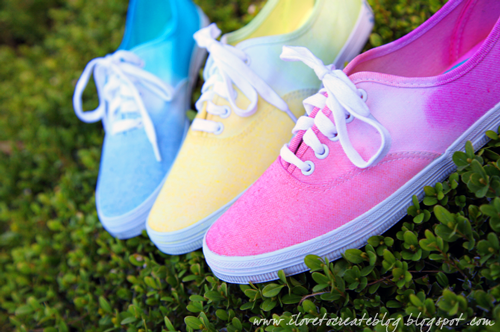 Use a paper towel to wipe off excess dye around rubber soles to prevent dye from running down shoes. 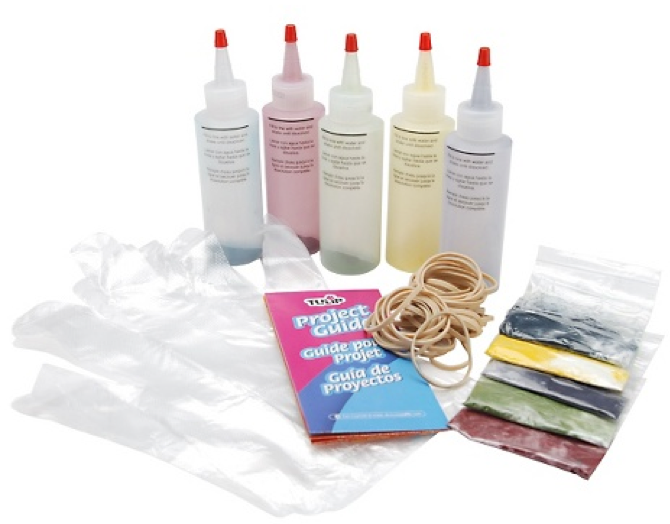 Repeat for other end of shoes with a different dye color. As you can see, we are finishing off the blue pair here. 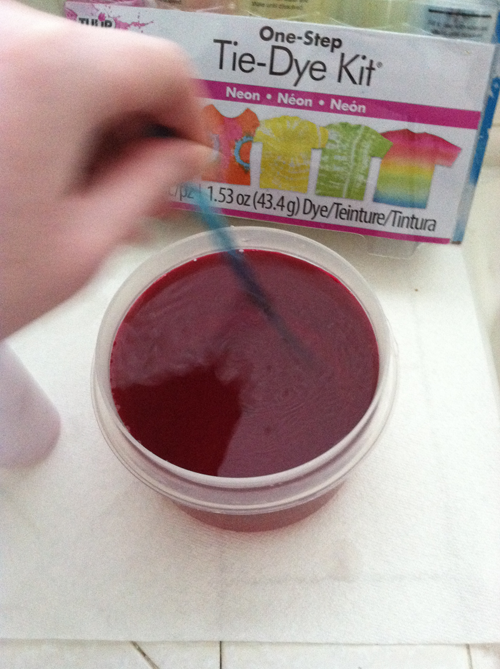 Tip: If dye is too light, use a paintbrush and paint another layer of dye on top. 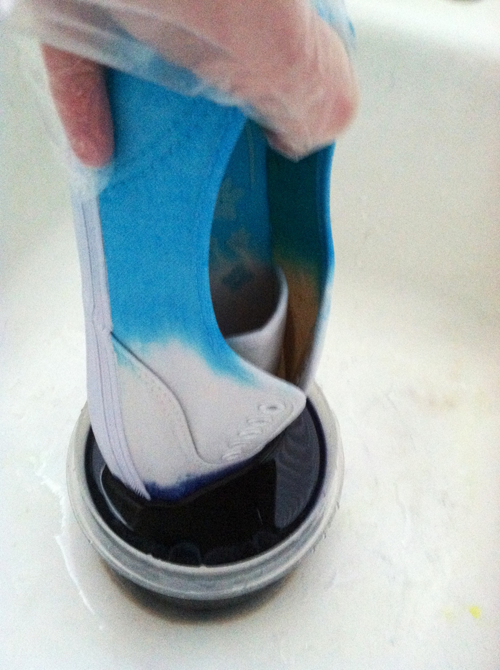 If dye is blotchy, use a paintbrush to lightly brush water over entire shoe. Set shoes out to dry overnight or for 6-8 hours. We love how they turned out! They definitely make us want to put a little "spring" in our step! wondering if sneakers will fade on feet? you can always go over them with a light coat of matte sealant spray from any hardware/art supply store, or even the DIY/home section of walmart, meijer, etc. Where did u get the shoes? That latest ombre dyeing trend is fantastic! It's easy to do, stylish, and most of all, it does not cost a lot. Thank you for sharing your skills on making this do-it-yourself dip dye shoes. Howdy dudes! Astonishing stuff keep it up! !